If you want an original printed product but don’t have the time or skills to start from scratch, you’ve come to the right place. Our design gallery is your one-stop shop for online templates that you can choose, personalize, order and receive – all for a fraction of the price of other printers. 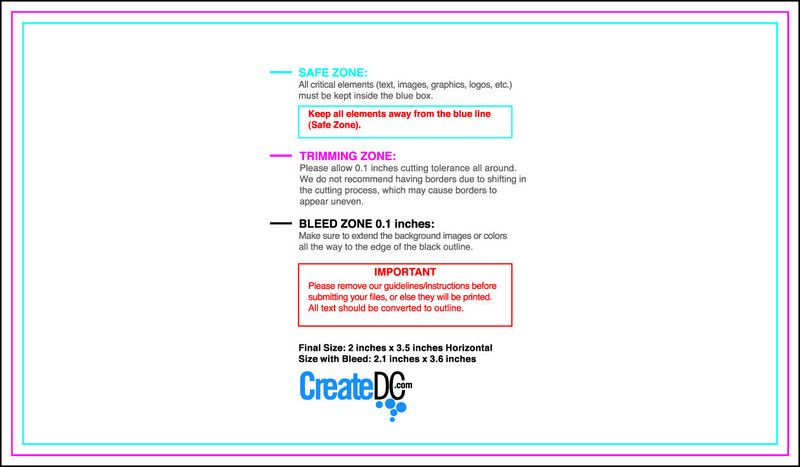 With CreateDC’s easy-to-personalize online design templates, we provide the starting point of your printing project, and you just need to add your own personal touch to create an original printed piece that is exactly what you want. Our design gallery features templates for everything from stickers and postcards to business cards and super-thick, premium ultra business cards and ultra postcards. You’ll be sure to find a printing template that suits your needs, whether it’s a grand opening event, a fun-filled party or a nonprofit fundraiser. There are plenty of designs that would be appropriate to promote your business, product or event. To Download Your Template Simply Locate The Size You Desire and Click To Download The File.